Back in 1912, an imaginative urban planner named Arthur Comey laid out a master plan for Houston that was based around continuous greenspace along the city’s bayous that would connect all our parks along the major bayous. Comey reasoned that “the backbone of a park system for Houston will naturally be its bayou or creek valleys, which readily lend themselves to parks and cannot so advantageously be used for any other purpose.” It took some time for Comey’s brilliant vision to begin to come to life though. 100 years in fact. It wasn’t until November 2012 that Comey’s master plan started to be put in place. That’s when Houston voted to approve a major bond referendum for the city’s parks that would set $100 million aside for Bayou Greenways 2020. 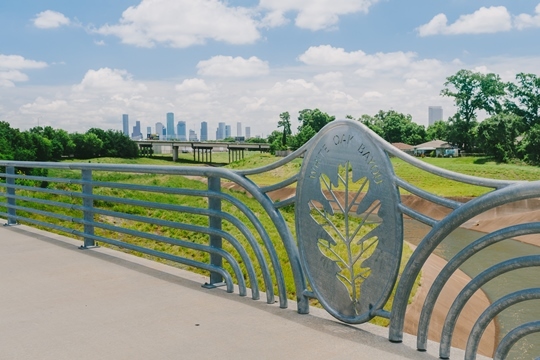 Bayou Greenways 2020 is a public-private partnership between Houston Parks Board and the Houston Parks and Recreation Department that is doing just what Comey envisioned, creating continuous and accessible parks and trails along the city’s major bayous. The project, which is one of the most ambitious parks projects in the whole country, is taking 3,000 acres of underutilized land alongside the bayous and transforming it by creating over 80 new miles of trails and an unprecedented network of connected parks along our major waterways. I love what Bayou Greenways 2020 has already done and will continue to do for our city (its estimated completion date is the year 2020), as I cherish every opportunity I have to get out with my boys or friends and explore Houston by bike or on foot. With Bayou Greenways 2020, it is becoming easier by the day to do this, and to do so in a beautiful setting that makes use of the city’s most significant natural resource, our bayous. One great way to take advantage of these greenways is by participating in the Park to Port Bike Ride. This fun 20-mile round-trip bike ride takes riders from Hermann Park’s Bayou Parkland east along the Bayou Greenway trail to the Port of Houston. After a “turn-around party” at Brady’s Landing, riders then follow the same route back and enjoy a post-ride celebration under the Bill Coates Bridge. I had a blast riding in this event last year and am looking forward to the 2017 edition which will take place on October 7th. What has me especially excited today about Bayou Greenways 2020 is Houston Parks Board’s new interactive map that really lets you dive into the greenways. Through the map you can explore the current greenways, those under construction and the future ones, with in depth details and notes about them all. I suggest taking a look so you can map out your next greenway adventure! Buying or selling a home, or simply want to discuss Bayou Greenways 2020 or the Park to Port Bike Ride in more depth? Give me a call at 713.829.3052 or email me at cynthia@cynthiamullins.com. JUST LISTED in Houston Heights! 616 E 10th Offered at $1,299,000.